Traditionally, the world of Scottish whisky is very – well – traditional. When popping champagne for Ardbeg’s two hundredth year, we somewhat neglected the rather less impressive twentieth birthday of the Arran Distillery. But distilleries are only as good as the products they are currently creating, and there is a lot to like about the bottles presently leaving the Isle of Arran. As well as a range of age statement whiskies they have a variety of cask finish expressions, and the one I happened to get my grubby little mitts on was finished in Amarone barrels. For the uneducated, which I will freely admit to being one of before buying the bottle, Amarone is a dry Italian red wine made from grapes such as Corvina, Rondinella and Molinara. Yup, me neither. I’ve had an up and down relationship with wine-matured whiskies, though one aspect I universally love is their amazing colours. The Arran is no exception – this whisky is the coppery orange of traditional creaming soda. The nose is alluring, giving the impression of alcohol soaked fruits eaten at Christmas time. There are cherries and strawberries as well as honey and syrupy cola. The palate is rich and spicy, aided immensely by the higher bottling strength of 50%. It is delightfully creamy with large dollops of toffee, oranges and Turkish delight. The finish is dry with notes of oak and dark chocolate, and is pleasingly long and warming. 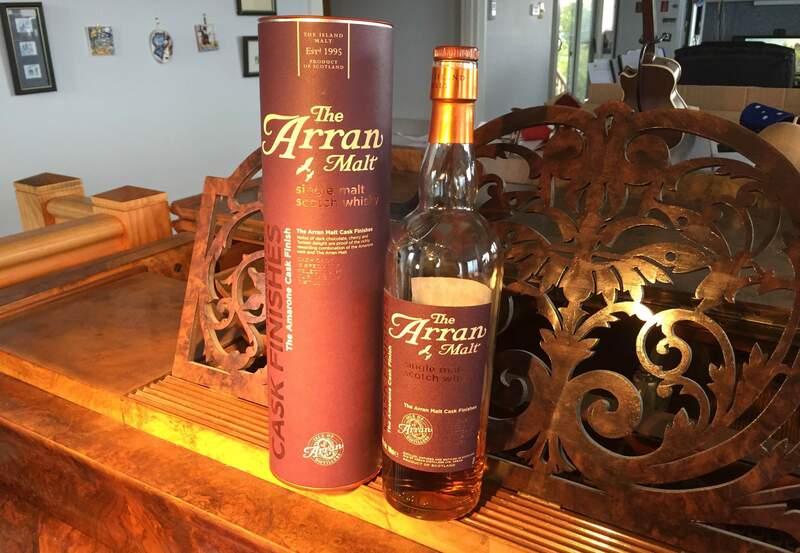 While the Arran Malt does not boast the long history of many distilleries, this should not in any way be held against it. A glorious Scottish past does not always equal quality in the present. Just ask Rangers Football Club.